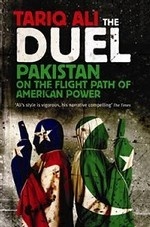 Аннотация к книге "The Duel: Pakistan on the Flight Path of American Power"
Pakistan stands on the front line of the war against terror. Yet this long-time ally of the West, whose links with the US have caused enormous friction within the country, is in deepening crisis. As President Pervez Musharraf struggles to cling to power through states of emergency, press curbs and imprisonment of his opponents, a range of forces threaten to destroy him and tip the country into a full-blown civil war. Drawing on extensive first-hand research and personal knowledge, Tariq Ali investigates both the causes and the consequences of Pakistan`s rapid spiral into political chaos. Shedding new light on controversial questions (did the US greenlight the execution of President Zufikar Ali Bhutto in 1979? Is NATO negotiating to grant the Taliban a role in Afghanistan? Are those now jockeying for power any less corrupt than Musharraf`s current cronies?) he examines the various disparate elements and each of the key individuals whose conflicts are tearing Pakistan apart.